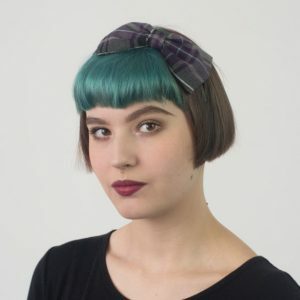 A machine made purple wool beret hat customised with a large handmade purple and grey tartan bow. These berets are the perfect winter accessory. The classic tartan winter trend gets an upgrade with these great colour combinations…Winter doesn’t have to be dull! 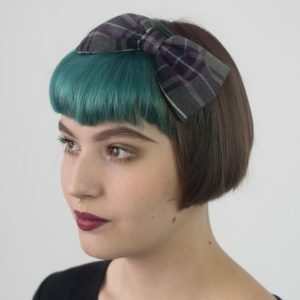 This tartan is also available in combination with a grey beret. These berets are approximately 25cm (10 inches) in diameter and are a ladies one size. They will comfortably fit a an average head size of approximately 21-22 inches. However, they do stretch with regular wearing. It is also possible to make the berets bigger by unfolding the inner lip of the beret. This does increase the size significantly. The bow is approximately 15cm (6 inches) long and 8cm (3 inches) across.